Figure 1. A massive leafy gall at the base of a naturally infected young buddleia plant. Leafy gall disease is like an unnoticed leak: what starts out small can get worse and end up causing significant losses. Leafy gall is caused by the bacterium Rhodococcus, which afflicts annuals, herbaceous perennials, and woody broadleaf plants. 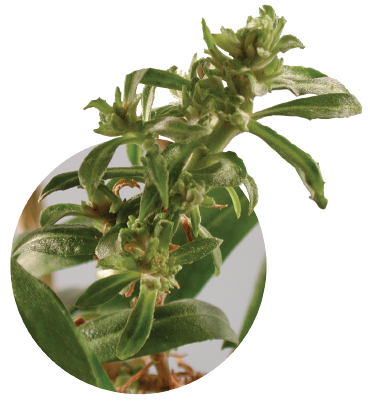 The bacteria cause a ball-like mass of buds that only partially expand into stunted shoots. These shoots are usually found at the base of the plant (Figure 1), but are also occasionally found on branches (Figure 2). The bacteria have a phase where they persist on the surface of leaves and leaf axils without causing infection. Triggered by some yet-to-be-understood signal, the bacteria on the surface enter the interior of the plant, initiating leafy gall formation. There is no known cure, so once this happens, infected plants must be destroyed. Figure 2. 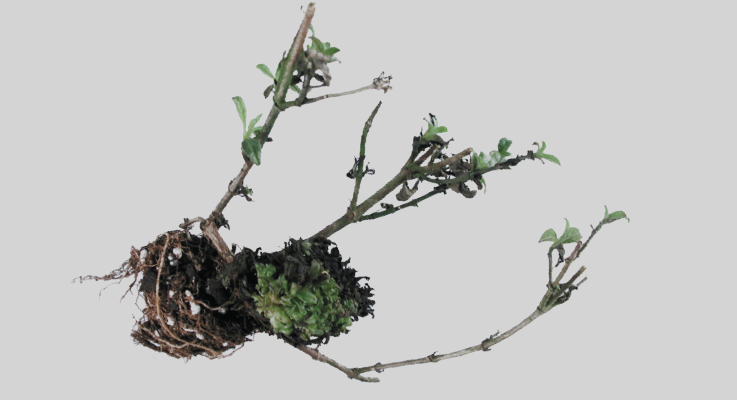 Multiple leafy galls arising from an Erysimum stem inoculated with Rhodococcus. Although leafy gall disease was first identified early in the last century, there remains little known about it. We know from our own experiments that water splashing off infected plants can readily move the bacteria to plants up to 4 inches away. These plants can then develop the disease. Water splash is probably why the disease can rip through a flat of highly susceptible plants such as Veronica spicata and Leucanthemum. We also know that we can detect Rhodococcus in potting mix up to three months after the bacteria were spiked into the mix. However, there are more questions than answers: Where does Rhodococcus come from? Do growers buy it in with purchased plants, or does it persist on site? Are tools a likely source of infection? If so, which products are effective at eradicating the bacteria? With funding from the Specialty Crops Research Initiative, we at Oregon State University have been working to address these questions and are coming up with information that can fill these knowledge gaps. Since herbaceous perennials are handled frequently — being clipped, pinched, or sheared — we wondered whether cutting tools could transmit Rhodococcus. Could we cause infection simply by cutting through an infected plant, and then through healthy plants? To test this, we used two plant hosts as our subjects: Oenothera speciosa and Petunia × hybrida. We took a pair of clippers and cut through a leafy gall on a diseased plant. Without disinfecting the clippers, we cut sequentially into 10 healthy plants. If the healthy plants become diseased, we would have evidence of movement of the bacteria on the clippers. We repeated the procedure six times for both Oenothera and Petunia, then allowed sufficient time for symptom development, after which we examined the plants. In more than 120 plants evaluated, we did not find a single one that was diseased. We looked at the question of potential transmission another way. We put Rhodococcus on clippers in known amounts, from 100 to 1 billion bacterial cells per milliliter. We then cut through healthy plants to see whether the plants would become infected. After three trials at each of eight different concentrations, we found that it took extraordinarily high numbers of bacteria to result in disease: Only when the clippers were coated with 100 million bacteria did leafy galls develop. In addition, there was a dramatic difference in infection rates between Oenothera and Petunia. In the former, fewer than 30 percent of the plants became infected, whereas up to 80 percent of the petunias developed disease at the same bacterial concentration. Of course only a fraction of the bacteria actually came into contact with the cut stems in these experiments — our estimates are about 1 million bacteria — but this experiment showed that blades could consistently transmit the bacteria when they are present in considerable numbers. There also may be a moisture component that favors bacterial infection. Petunia stems are more succulent than Oenothera stems, and leave more sap on the clippers. These experiments show that Rhodococcus infection can be initiated when bacteria are on the clippers, especially in the presence of sap. This means infected plants could be donating bacteria to mower blades during pruning operations of perennials, putting downstream plants at risk. At this point, we knew that clippers could transmit the bacteria. What would effectively sanitize them? We tested the ability of nine compounds to kill Rhodococcus bacteria growing in artificial broth culture (free-living) and in a biofilm. Biofilms are a matrix of bacterial metabolites and other substances in which the bacteria are enmeshed. Biofilms protect the bacteria from environmental extremes, and biofilm-inhabiting bacteria are much more difficult to eradicate than bacteria that are free-living. We allowed Rhodococcus to form biofilms on plastic cylinders made of high-density polyethylene, the same type of plastic from which many pots are made. 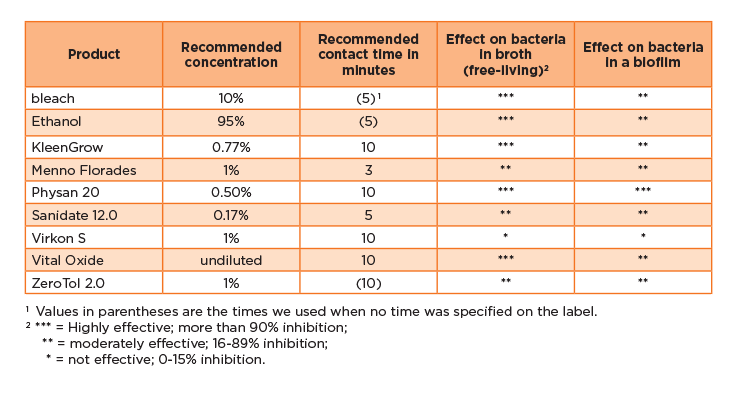 The nine products were then tested at various contact times on both free-living and biofilm bacteria (see sidebar). We found, as expected, that bacteria growing in a liquid medium were more easily killed than those growing in a biofilm. Bleach, ethanol, KleenGrow™, Physan 20, and Vital Oxide were all effective at killing the bacteria that were free living; the latter four products were used at label rates and contact times. Only Physan 20, when used according to the label, was best at killing the bacteria in biofilms. These results suggest that surfaces which have had only a brief exposure to the bacteria, such as clippers, would be disinfected more easily than something like a pot or flat where the bacteria had developed a protective biofilm layer. As with any sanitation product, the surface must be free of organic matter to ensure effective treatment. The powerful tool of genomics has transformed microbiology. Genomics refers to the study of the chromosome and all other genetic information within an organism (its genome). We used genomics as a hunter uses spoor when tracking quarry, to gain insight into movement of Rhodococcus across time and space. My colleague, Dr. Jeff Chang, led this portion of the study, which analyzed the genomes of more than 60 Rhodococcus bacteria, isolated from plants sent to the OSU Plant Clinic for 16 years from 15 nurseries in 11 states across the country. What we found has transformed our understanding of leafy gall bacteria. For more than 50 years there has been only one named species of Rhodococcus that infected plants: Rhodococcus fascians. We blew that one out of the water. The 60 bacteria we analyzed fell into eight groups genetically distant enough to be considered separate species. However, all the bacteria caused the same symptoms, so instead of creating confusion by establishing new species names, we simply refer to leafy gall-producing bacteria as pathogenic Rhodococcus. More interesting were the secrets revealed by the isolates themselves regarding their incidence in nurseries. We found that a single nursery could have up to seven genetically distinct “species” of Rhodococcus in its plants. This genetic richness would occur when such nurseries had received the bacteria multiple times in independent introductions. One particular nursery for which this was true also appeared to have a reservoir of Rhodococcus on site, as bacteria that were essentially identical were recovered from young plants separated in time by five years (that is, the plants were sent to the Plant Clinic in two different years, five years apart). The fact of different generations of plants containing genetically identical bacteria is extremely unlikely unless the bacteria were living at the nursery from one year to the next. Additionally, one nursery had a single, individual plant that was co-infected with three different “species” of Rhodococcus. Finally, we found two instances where genetically similar bacteria had been recovered from three different nurseries. This activity suggests that infected plants may have come from one nursery, and was shipped to the other two. This study was the first that tracked plant pathogenic bacteria using genomics. Analysis of the genetic information in the bacterial cells was like having little light bulbs turning on: A previously murky landscape was suddenly illuminated. We saw that some nurseries were defeating their own cleanliness efforts by unknowingly maintaining the bacteria on site, in infected plants or perhaps in soil. Further, and more alarmingly, we found evidence that new, genetically novel bacteria had developed in nurseries that were harboring them — a result of movement of genes between the bacteria. Our efforts across the past 10 years have been to help growers recognize and understand leafy gall disease. We have developed a list of susceptible plants, along with a photo archive of symptoms (http://plant-clinic.bpp.oregonstate.edu/rhodococcus/). We have developed rapid molecular assays for laboratory detection of the bacteria. We have shown the ease by which the bacteria can spread in water, and may be maintained in soil. In the work presented here, we have confirmed that Rhodococcus can be transmitted on cutting tools and have identified products that are effective in eradicating Rhodococcus on surfaces. We have shown the importance of swift detection and effective sanitation in preventing leafy gall disease. Current, ongoing efforts include screening natural products for the ability to prevent Rhodococcus infection, and development of a rapid on-site diagnostic tool for use by growers that will enable in-house monitoring and testing. We are doing all we can to shed light on these poorly understood bacteria and the disease they cause.